Illustration of a plumber worker tradesman holding monkey wrench with tile in background done in retro style. A slab leak right under your home’s foundation can be frustrating because, as a homeowner, you don’t have the necessary equipment to find out about the origins and causes of the slab leak. However, we are plumbing experts and understand how important locating and fixing a slab leak can be. We advise you not to try and fix the slab leak on your own. Just leave it to professionals like us. Our trained, qualified and licensed professionals will fix the leak in no time at all, and you will be able to live in a perfect home. The following are some things you must know about slab leaks. Slab leak is caused from the cold or hot water line under the property’s concrete foundation. The size of the leak can be extremely small – as little as a pinhole. However, sometimes the leak is big in size. Slab leaks can be caused due to a variety of reasons. For instance, improperly soldered pipes can cause slab leaks. These leaks can also be caused by corrosion. When the copper isn’t wrapped properly, it could cause slab leaks. Other reasons include bad quality of water, concrete causing the pipe to get damaged, and general wear and tear. How Do I Know If I Have a Slab Leak? The first sign of a slab leak would be water that would seep through your floors. If the slab leak is caused by your hot water line, you will find hot water on the floor. If you have hardwood floors in your house, they might start buckling due to a slab leak. 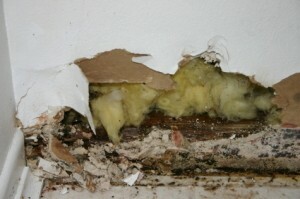 If you notice moisture in your walls, that is another sign of a slab leak. Sometimes, something as simple as very high water bills could indicate that there is a leak somewhere. Turn off all the water sources in the house, including the main one, and notice the water meter. Is it still running? This means you have a slab leak. The plumbing repair takes about 2 or so days. However, it could take more time to repair the walls, foundation and flooring. Professionals use location devices, air tanks, thermal imaging cameras, moisture reader and listening devices to locate the leak. Always choose quality professionals like us for the leak and never attempt to fix it on your own. You could end up making the problem worse than before.